It all started with a Facebook post from the Foo Fighters one August afternoon reminding fans to sign up for online activism. With just a few targeted clicks, registered members spreading the word on eliminating extreme poverty would automatically be entered into a lottery for the Global Citizen Festival in Central Park’s Great Lawn in late September. For those wondering, this effort is further evidence that social media is here to stay, in one form or another. This is the age we live in now. Anything can change and happen in an instant. Having never seen Foo Fighters live, this seemed like a very good/necessary proposition to check out. Once a ‘global citizen,’ then articles needed to be read, videos watched and then shared through social media. These efforts amounted to points and when 3 were earned, our name was entered into a lottery for free tickets to this huge concert/festival. Taking few chances, somewhere between 12 and 15 points were accumulated. The articles and videos are heartfelt and are enlightening as variations of extreme poverty around the world and the individuals leading incredible change are highlighted. They are powerful moments. The time would soon come for the digital wheel to spin and hope for the best. I was cautiously optimistic. Congratulations — by taking part as a Global Citizen, you’ve won two tickets to the Global Festival! Friday, September 28th at 8:55 a.m. was the first flight of the day to Reagan National Airport and then onto LaGuardia. Problem was that the scheduled flight to NYC was cancelled due to weather conditions, yet word spread quickly among my fellow passengers that it was not even raining at our hopeful destination from their friends on the ground. Hmmm? The next step was to get in line at, and by this I mean sprint, Customer Service. These were the last two words anybody wanted to hear. I was in the first third of the line and by some stroke of luck behind a very pretty girl. Mustering up the courage to talk to her, we ended up having a nice conversation. As it turned out, our hotels were fairly close to each other and we decided to split a cab into New York city. Before venturing into the city, I asked her out to dinner. To my surprise and elation, she said yes with a smile. It seemed almost like a movie. Two strangers meet before a rescheduled flight who are from the same state going to the same incredible concert for the same bands and are staying within two football fields of one another in one of the biggest cities in the world. We both decided to wind down on our own after a long day of flying and driving. My late afternoon stroll would come to be the best and worst decision I made that day. As it turned out, returning to my hotel room after this unbelievable encounter plus the time spent making a reservation actually cost me the date for that very reservation. Her friends likely had arrived into town earlier than she initially thought and she was already out. These things happen. Talk about a pendulum swing of a high and low in less than half an hour! Sometimes that’s just how the ball rolls. Many things could be written about this weekend, including: standing in line outside Central Park and at the concert with a good friend from college from 11:00 a.m.-9:00 p.m. (should have gone East Gate), the sheer atmosphere of 60,000 people flowing into an outdoor concert on the Great Lawn, seeing actress Olivia Wilde and Victoria’s Secret model Erin Heatherton speak during the concert, the ‘girl from the line’ and I trying to spot each other at the concert by texts, watching the Black Keys and Foo Fighters perform live for the first time (w/ Foo Fighters going on hiatus afterwards), getting Belgian fries in the lower east side or riding the 2:00 a.m. train to the Bronx. 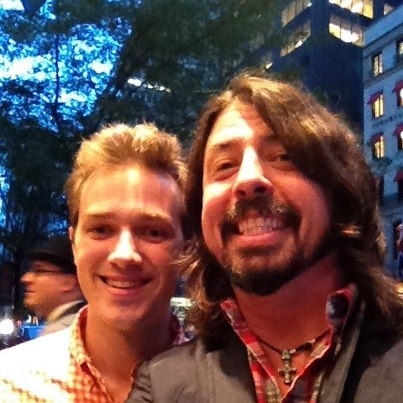 Posted on October 3, 2012, in Uncategorized and tagged Central Park, Dave Grohl, Foo Fighters, Global Citizen Festival, tickets. Bookmark the permalink. 1 Comment. this is amazing! you’re so lucky!